Our QA/QC team is constantly working hard to ensure both of our facilities are running in tip-top shape. Nicole DeGeorge is a key member of this team and most recently played an instrumental role in adding Food Ingredient to the scope of MDG’s HACCP Certification. MDG caught my eye back in 2015. From working in third-party testing labs over a number of years, I already had a lot of regulatory and laboratory experience under my belt. MDG offered a rare opportunity to put some of the more specialized knowledge to use and to start growing my career in a unique way. I was also impressed by their commitment to helping communities near and far. Many companies are all talk when it comes to that sort of thing; on my first visit I was able to see how much they had accomplished through their Feed, Clean, Save (FCS) program. Over the years, this has been changing dramatically. I’m finding myself doing much more than just performing routine testing for our products. Recently, more and more of my time is spent programming/coding and developing technological solutions for handling all the data we collect in addition to analyzing some of that data with our other departments. The other big change has been my growing role in our quality assurance efforts. This involves a lot of work in ensuring that our documentation and policies are compliant with both customer requirements and regulatory standards. Right now, I’m expanding the laboratory information management system (LIMS) I developed for MDG to include inventory tracking for ingredients. While we already have traceability with our inventory, this will help us speed up the process of tracking lot usage and give us a more comprehensive audit trail whenever changes are made to inventory. I’ve also been performing some more in-depth analysis of our tank data—I’m hoping I can find some trends that will help us get higher spore yields out of our tanks. A truly gratifying part of working at MDG is working together with the whole team to solve a big problem or in finding a more efficient way of doing our day-to-day work. MDG always encourages collaboration between departments and all levels of employees; when we tackle a big problem together and find a solution, it really highlights how much every single employee here contributes. I really enjoy getting outside during the warmer months! I like running with my dog Tigh, going to baseball games, and hitting the road to do some traveling. I also appreciate giving my brain a break from science and regulations by engaging in some creative hobbies—writing and music have been taking up a lot of my free time lately. With how much my role has been shifting lately, this is a difficult one to answer. I am hoping that more of my time will be spent with QA, but only time will tell! We already had the GMP (good manufacturing practices) and policies established and in place to safely manufacture Bacillus intended for human consumption. We finally made it official by adding it to our HACCP certification scope. This has been a goal of ours but required a third-party audit to start. While audits always are a time-consuming, stressful process for a company, we successfully proved that our processes are sufficient to safely produce food ingredient material. 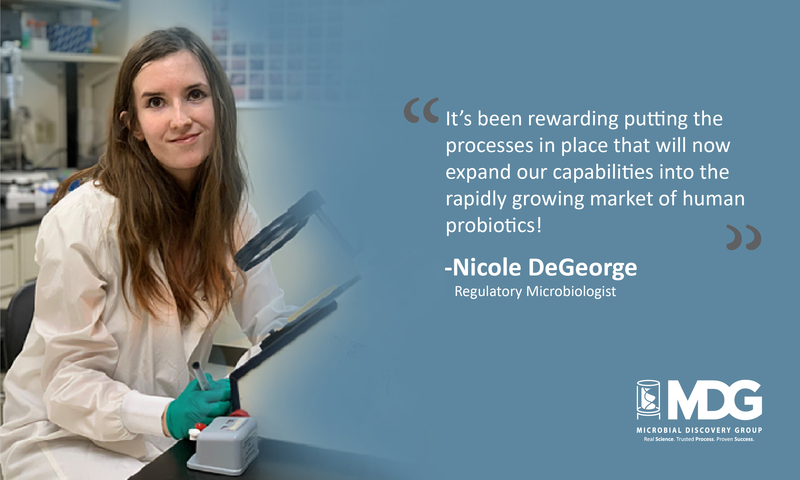 We’re very proud of this certification and the new opportunities it gives us to expand our custom fermentation capabilities into the rapidly growing market of human probiotics!